Over the years, The Herd has striven to do what it can to further the support of Chariho Athletics. 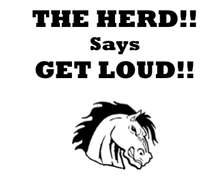 The Herd creates a memorable, fun, RESPONSIBLE environment for all students, athletes, teachers, family, friends and fans. If you support Chariho Athletics... JOIN THE HERD!